and metal barricades, police sirens wail continuously and traffic jams resembling Mumbai roads are the order of the day. The likelihood of Al-Qaida getting its hands on Pakistan�s nuclear weapons keeps many in the US awake despite President Barack Obama�s recent expressions of confidence in the security at these facilities. 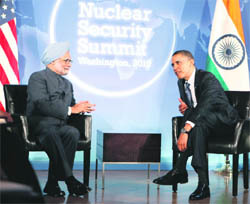 These concerns are likely to be discussed at the Nuclear Security Summit, which started here on Monday. Hosts India faced little resistance from their traditional rivals Pakistan as they scripted an easy win (58-24) in the final of the inaugural edition of the Pearls World Cup Kabaddi which concluded at Guru Nanak Stadium here today. 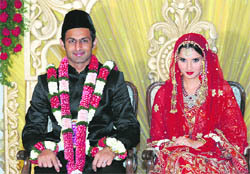 After several twists and turns, the cross-border romance of tennis star Sania Mirza and cricketer Shoaib Malik reached a fairytale climax today. Unable to face mounting pressure from both the ruling and opposition parties at Parliament, the government of Nepal on Sunday decided to nullify its decision to award the contract of printing machine readable passports (MRPs) to an Indian company.